We said we were going to be bringing back Member and Admin of the month and we are! There will be a little twist coming as well which you will all see in the coming days. Enough about that, and let's move onto the Admin of the month. This individual has been nothing but loads of amazing for this community. They constantly greet people, post on the forums, active on discord, promote their section and the list could literally go on for days with what they have been doing recently for =ADK=. I don't think much more needs to be said for this individual as when you see who it is, I'm certain you'll all agree. Thank you Liz for all that you've being doing for the community, it's definitely not gone unnoticed and it's greatly appreciated! Stay tuned for the Member of the Month! Edit: I was ingame when I found this out, so my original post is a lil short. I do really want to thank everyone in this community for being so welcoming to me. I've only been here for about two months, and I hope to be here for many many more. I'm glad that all the work I try to put into the community is recognized, it definitely gives me a warm feeling. I really want to make ADK a very open place where everyone is welcome. I know some of you may not know me well since I mostly hang out in Overwatch, but don't ever hesitate to come chat. I want to get to know all of you and make all of you feel like you have a place here. Thank you for the honor of being presented with admin of the month. It means a lot to me. Congratulations @Liz! You deserve it. You extended a warm welcome to me and my wife into the community and we both appreciate it! Heck yeah! I think I fixed my league, so I look forward to playing. And thank you very much for your kind words. Congratulations! You've been doing a great job on replying to new intro threads and have brought many new members in to the community from Overwatch and a few other games. Glad to see you got admin of the month. Thank you Soap. Much appreciated. GJ Liz, I might not ban karma next inhouse for you. But in all seriousness you deserve it. 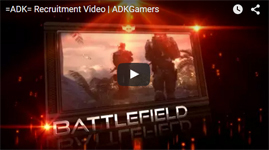 You put in a ridiculous amount of time and effort into making ADK a welcome place for members and new people. You've helped the overwatch section explode and continue to bring members in each week. You've been willing to voice your opinions when you know it may not be the most liked, so we can all grow from experiences. You've just been you, and thats more than deserving of the Admin of the Month. That would be the best gift. Thank you very much. I'm glad that Overwatch is continuing to grow and prosper. It's awesome being part of such a wonderful section. I'm glad even some of my harsher opinions are listened to, it's definitely refreshing. Hoping to continue to make the section the best it can be! @Rosebud thank you very much <3 I couldn't have done it without an awesome person like you by my side.